VANCOUVER – The use of template financial statements and related products has produced boilerplate disclosures and clutter in the financial statements. This at a time when the Canadian accounting profession is striving for a sense of completeness with aids such as disclosure checklists. It’s no wonder there are questions around the value of external financial statements when disclosures are not tailored to the entity. and detailed breakdowns of amounts in the financial statements. any unusual events which would highlight any significant changes from prior periods. In the performance of cyclical monitoring, I see how far away many financial statements are from focusing on these presentation and disclosure requirements. The first round of automation of the accounting profession — the use of template financial statements and related products — only exacerbated this issue. Let’s look at a few examples, identify some potential causes and focus on what we can all do to move external financial statements back into a product we are all proud to deliver. the ability to collect is reasonably assured. With verbiage directly from the CPA Canada Handbook standards for revenue, which presumably meets a minimum disclosure requirement (if the entity is a retailer! ), this note adds little information. Revenue recognition in many entities, such as the construction sector, is much more complicated. Where is the consideration related to multiple revenue streams, whether delivery to customers is actually when title transfers, estimates for returns and allowances or warranties, online sales, issuance of gift cards or the effect of other electronic commerce changes in business? Property and equipment are amortized over their useful lives. The Company periodically reviews the useful lives and the carrying values of its property and equipment for continued appropriateness. The Company reviews for impairment of property and equipment to be held and used whenever events or changes in circumstances indicate that the carrying amount of the assets may not be recoverable. If the sum of the undiscounted expected future cash flows expected to result from the sue and eventual disposition of an asset is less than its carrying amount, it is considered to be impaired. An impairment loss is measured at the amount by which the carrying amount of the asset exceeds its fair value. When quoted market prices are not available, the Company uses the expected future cash flows discounted at a rate commensurate with the risks associated with the recover of the asset as an estimate of fair value. Ignoring the jargon and lack of useful information included in this accounting policy note, the question is why is it included? There is no option as to how or when an impairment of long-lived assets is recognized under the accounting standards for private enterprises. The inclusion of this policy in the financial statements does little more than encourage the reader to try to find the impairment. When one is not found and a question is posed, perhaps at a board meeting, a sentence such as the following is commonly found: As at December 31, 2017 there is no impairment recognized. Credit risk is the risk that one party to a financial asset will cause a financial loss for the company by failing to discharge an obligation. The company’s credit risk is mainly related to accounts receivable and notes receivable. The company provides credit to its clients in the normal course of its operations. If users are focusing on risk disclosures to provide information to allow a comparison between entities and an assessment as to future cash flows, they are not likely to find value in the boilerplate disclosures found in the financial instrument risk disclosures. The sample disclosures are once again derived from the CPA Canada Handbook standards for financial instruments and provide what would be considered obvious sources of credit risk. Unfortunately, the verbiage used is the definition of the various risks, not the inclusion of entity-specific information to provide an ability to risk-weight an organization. Where is the information about the entities specific credit granting policies, terms provide to customers and perhaps the historical experience with bad debts? Unusual events can occur in any area of the financial statements. It is the absence of disclosure, or the lack of depth of disclosure, which is commonly the issue. Identification of the cause or triggering event, the full financial effect as well as the likelihood of the event re-occurring, would be a good starting point. 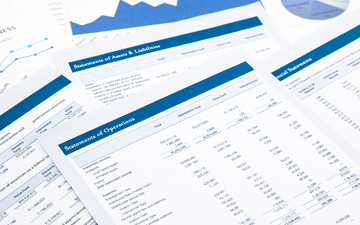 In my next column, “3 ways accounting practitioners can improve the quality of financial statement disclosures,” I will provide a pathway from clutter to clarity. In the meantime, if we can help you in customizing your financial statements or note disclosures, contact Clearline Consulting. For further inspiration or support, visit Resources at Clearline Consulting. Bridget Noonan, CPA, CA, is a partner at Clearline Consulting, which provides practitioners and their staff with the tools, training and advice they need to succeed and build thriving accounting firms. To receive our public practice newsletter visit our website or provide your contact information here.